Drag. Energy dissipated by fluid friction along the boat. .
Energy dissipated by the slip of the blade through the water. .
To calculate the magnitude of energy dissipated the third sink, I follow the approach taken by Van Holst, as described here and here. Figure 1 shows the result of a typical single stroke simulation. The system is in equilibrium, i.e. the hull speed at the start of the stroke is constant from stroke to stroke. The simulation was done for a single scull heavy rower rowing at an average velocity of 4.74 m/s, which corresponds to a 500m time of 1:45.5. Positive values mean power supplied to the system by the rower, while negative values mean power absorbed from the system by the rower. This power cannot be reused and is thus lost for propulsion. Atkinson argues that the absorption of kinetic energy is done by different muscle groups than the generation, and this is reflected here by assuming it takes 1W to absorb 1W of kinetic energy, as depicted in the right hand side of the figure. (See also the discussion by Van Holst about energy consumed while walking down the stairs). In the simplified example of Van Holst, indeed some dissipation in the rower occurs. 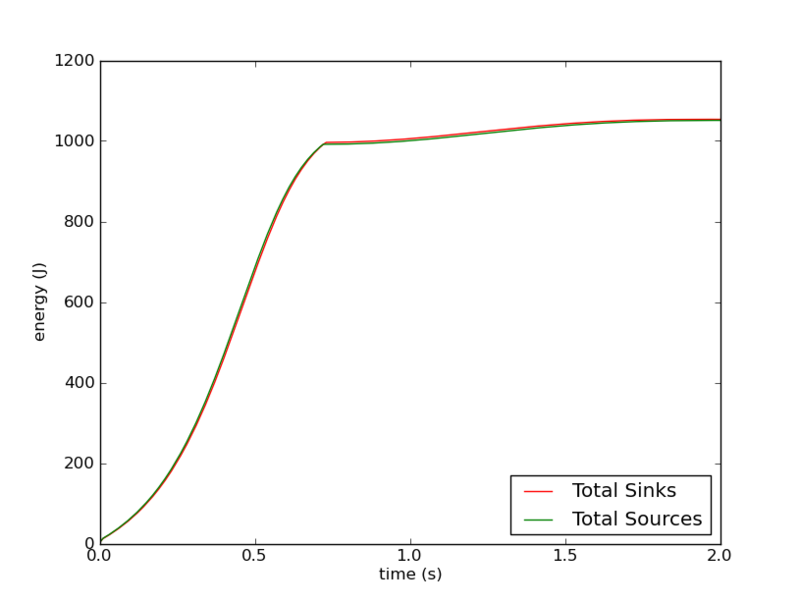 In my simulation results in figure 2, I see hardly any power dissipation, which is in agreement with the simulation results of Van Holst in the realistic system but in contrast with Atkinson’s findings. I guess a discussion on this is needed. Figure 3 shows the energy invested into the system by the rower as a function of the time during the stroke. The blue line is the energy provided by (the area under the graph in figure 2). The black line, “puddle energy” is energy used to drag the blade through the water creating the puddle. 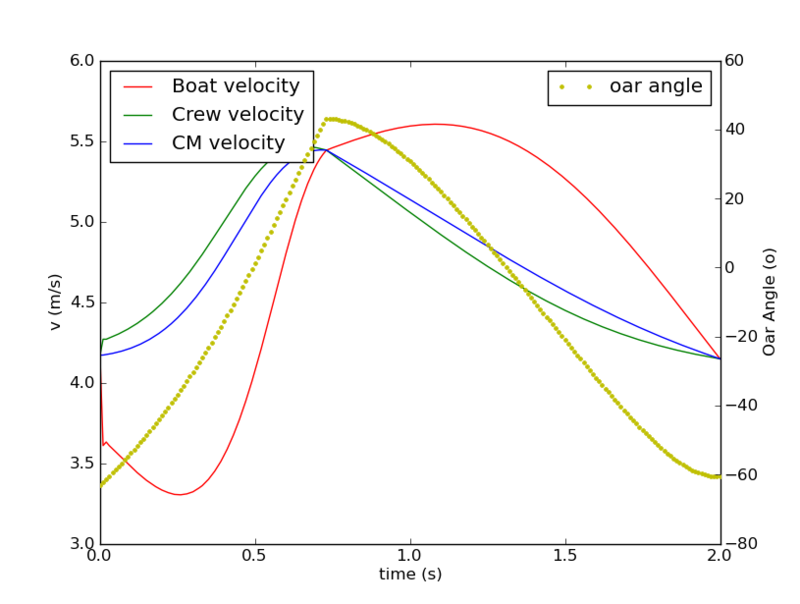 The red line is the propulsive energy accelerating the boat at the oarlock, and the green line is the total energy. The efficiency of the stroke is the ratio of energy dissipated in overcoming the hull friction vs. the total energy dissipated in the system. The typical efficiency values that I find are around 77-80%. This is significantly higher than Atkinson, probably due to the fact that I find negligible values of . It is interesting to see that a significant portion of the rower energy is delivered through the kinetic energy of the rower (“through the footboard”). However, in real life, it is very hard for a rower to decouple these two, except for slight differences due to rowing style. One could wonder for example about the efficiency of different types of catch (“trunk swing” vs “leg push”), and perhaps I will try to model it in the future. In my model, this would be implemented as a different function of rower body of mass vs handle position. This entry was posted in rowing physics, Uncategorized on July 20, 2010 by sanderroosendaal. 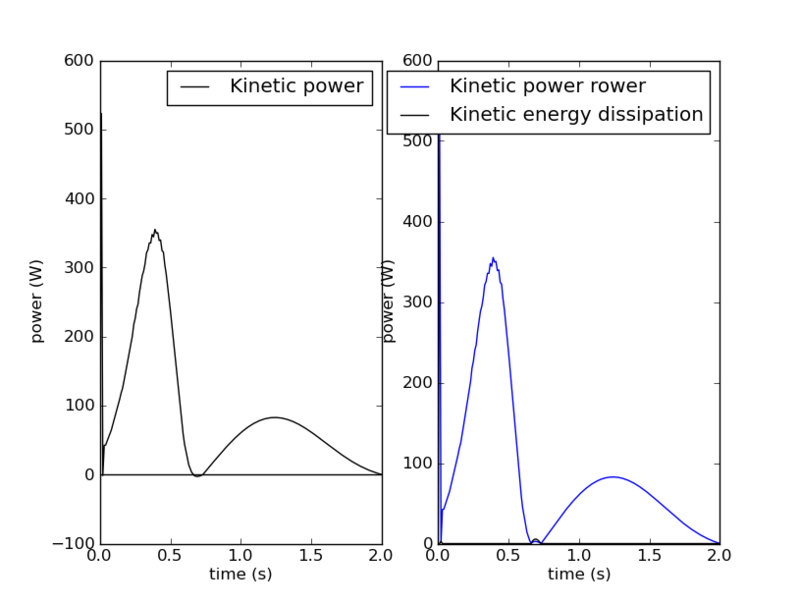 In regard to FIg.2 of your July post there are two “kinetic power” lobes shown. Relative to the boat the first ts presumably during the drive to slide backstops and the second during the free return to frontstops- during which, in the second, the handle force is essentially zero. I estimate (by counting squares) that the works done in under each (blue curve) are about 115J and 57J respectively. Total: 172J. This energy is not dissipated in drag or in puddles. Nor is much, if any, of it recovered (as by means of springs) in the body of the rower. Thus, I take all of it to be irrecoverable. And if this is true must the work not have been supplied by the rower to be dissipated internally in heat? Comparing these figures to some of mine- for a 90kg rower at 3.8 m/s and 21.4 1/min- I find a total so-called “internal energy” of 179J, very close to your 172J (within 4%). My calculation method is numerical, not theoretical. I sum 1,000 incremental F(ds) over the stroke, where F is the incremental force between the rower and the footboard and ds is the incremental relative excursion. The results are values, both positive and negative, of which I take the absolute sum, for reasons which I have stated elsewhere. In a very similar way I have compared my result with one of van Holst obtaining a comparison within 2%. I do not follow your remark that “this energy is not dissipated in drag or in puddles”. Once, an angry swan landed on the stern of my single. I used to row past a swan’s nest and the animal didn’t like it at all. One day, after I had passed it, it took off, flew towards me and landed on the stern, contributing quite abruptly to the propulsion of the boat, its kinetic energy eventually being dissipated in drag and waves. This is my simplistic picture of the rower: During the stroke, the body of the rower is moving at a higher velocity than the boat. He “takes off” from the boat as if he were an angry swan, investing power in kinetic energy. At the end of the stroke, he “lands”, transferring kinetic energy to the boat and contributing to its propulsion, this energy eventually dissipated in drag. 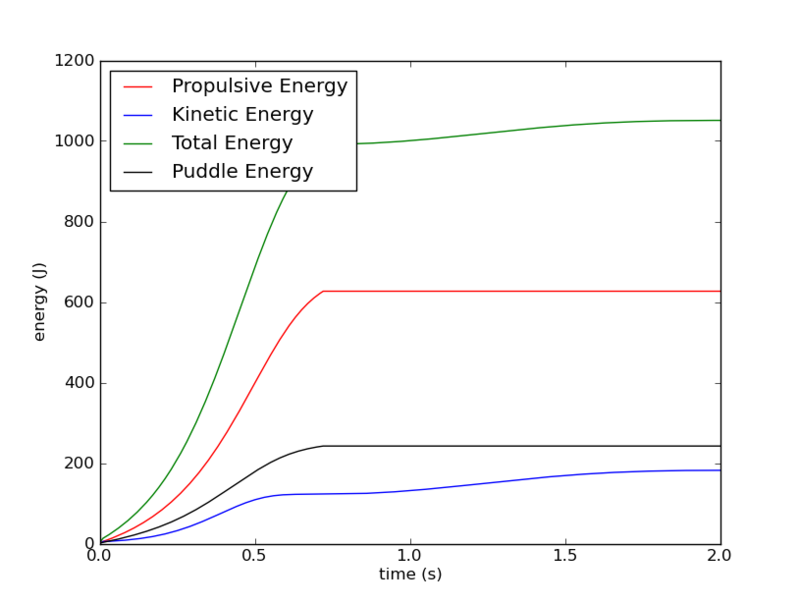 Looking at figures 4 and 5 in the post above, I have three sinks in my model: drag, puddles and rower dissipation. 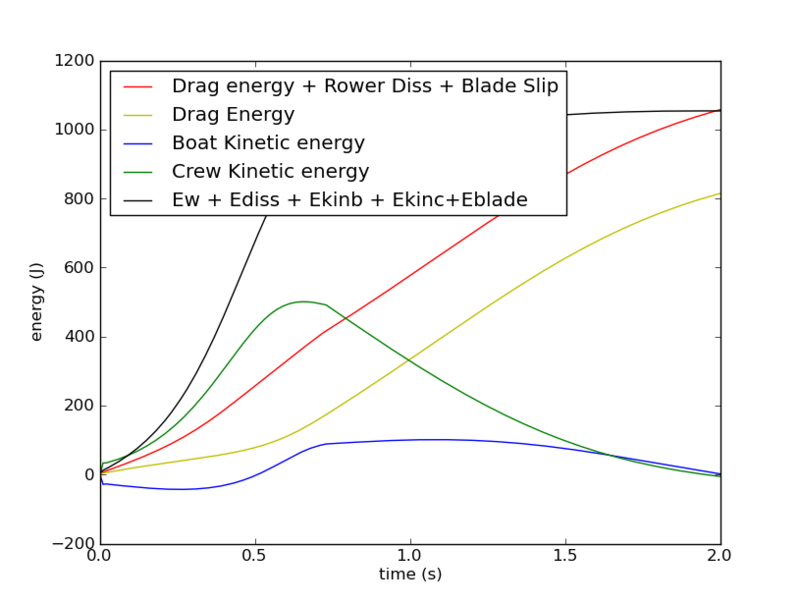 I have defined rower dissipation as the total energy under the negative lobes of the left-hand side of figure 2, arguing that a rower cannot store kinetic energy. The energy dissipated in the rower’s body is about 0.35% of the total energy (5.6 J of a total of 1609 J in an example that I just calculated). I guess we have to think about the muscles used in “reducing slide speed”, both at the end of the drive and in the second half of the recovery. The small negative lobe at approximately 0.7 seconds in figure 2, this is the point where the rower is not pushing the footboard but hanging in it, using some muscles in his legs and feet to come to a stop. A similar negative lobe is not present for this stroke in the recovery, but a real rower will “waste” some energy at the catch by accelerating his body towards the bow before the blade has caught pressure.